A 1987 bay mare by Promotion and out of the Bay El Bey daughter Dansel Maya, Pros Go Lightly was an English Pleasure superstar. In 1992, her inaugural show career, Pros Go Lightly was Top Ten at the U.S. Nationals in the Arabian English Pleasure Amateur Owner class in a field of 58. 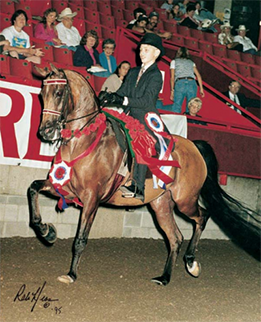 At the 1994 Canadian Nationals, she captured the National Championship title in Arabian English Pleasure Adult Amateur Owner 40 & Over and the Reserve National Championship in amateur driving. In 1995, her final show season, Pros Go Lightly amassed four Top Ten awards and one championship title at the three national shows: Canadian Nationals, Youth Nationals and U.S. Nationals.